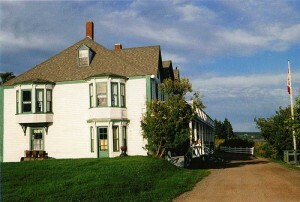 Ottawa House Museum in Parrsboro. Here’s what to see and do in Parrsboro. Try your hand at rockhounding on any one of the beaches near Parrsboro or anywhere along the coastline. You might get lucky and turn up a fossil or some amethyst to take back home. Just make sure to time your visit for low tide and be sure to return at least three hours before high tide. A rising tide can quickly catch you out and leave you stranded. This little house is run by Eldon George, the man who found the world’s smallest dinosaur footprints. See them in this shop, which he’s been running for six decades. There’s a wealth of fossils, minerals and gems on display and plenty of souvenirs for sale. See more on the Parrsboro Rock Shop website. The Ship’s Company Theatre started entertaining audiences in 1984 from the decks of an old ferry, the M.V. Kipawo. Now they’ve got a new facility but the heart of the theatre remains the same. It’s a showcase for plays with a local Maritime or Canadian theme and the season runs from July through October. They also run drama camps for kids and teach adults how to play the fiddle. See more on the Ship’s Company Theatre website. This community museum is about 4km from Parrsboro town centre and is set in a grand building, with a front verandah overlooking the beach. Parts of the house date back as far as 1775. There are hundreds of artifacts documenting the history of the building and area. Admission is just $2. It’s open daily from mid-May to mid-September, 10am to 6pm. See more on the Ottawa House Museum website.